Thank you for your question. When a printer refers to the I-Unit it usually means the image unit. Hello, do you sell imaging units for the Konica Minolta Magicolor 4695MF printer? Kind regards, Lucie. Yes, we do stock all of the four separate Konica Minolta Magicolor 4695MF imaging units, they are listed under the 'Maintenance items' section on this page (after the toner cartridges). We also supply 3 or 4 colour Magicolor 4695MF drum packs to give you better value for money when replacing all of the imaging drum units. I would like to purchase a waste toner for the Magicolor 4695MF printer but can't find it in your selection. Do you have this item for sale? Please follow the link below, these cartridges are guaranteed to work with your machine. I'm afraid we do not have any discount coupons at the moment. We recently got rid of a Konica Minolta A4 Magicolor 4695MF printer and have excess stock of the toner cartridges. We were wondering if you would buy them off us or perhaps exchange them for cartridges for our new Oki MC562 printer? I look forward to hearing back from you in due course. Kind regards, Fran. I have a warning on my Magicolor 4695MF printer that the imaging unit is low. What do I need to order when it runs out ? Thanks. The Konica Minolta Magicolour 4695MF printer uses four separate imaging units for black, cyan, magenta and yellow images. Your printer should inform you which imaging unit needs replacing by indicating a symbol for "K" black, "C" cyan, "M" magenta or "Y" yellow. Once you know which colour needs replacing you can locate the correct part number on our website on this page under the section 'Maintenance items'. I need to order a toner waste bottle for a Konica Minolta Magicolor 4695MF printer. Please confirm the right product code? What is this and do you stock them? Is the waste toner bottle part of a toner cartridge? Hi, I would be interested in purchasing a set of four Konica Minolta 4695MF toner cartridges. As I live in Guernsey, would you be able to sell them without VAT? Yes, please can you contact us over the telephone line as we would need to take some more details off you in order to remove the VAT on your order. I'm looking for toner for my Konica Minolta 4695MF laser printer. It's showing 'out of stock' on the website. Do you have any idea when they are available? Our Konica Minolta Magicolour 4695MF toner cartridges have been in high demand but we now have them back in stock and ready to order through the website. Could you please advise the approximate number of pages that a 3,500 yield toner would provide for an A4 page of text? Our page yields are based on 5% coverage of an A4 page so a 3,500 page toner cartridge would print approximately 3,500 pages at 5% coverage. However, 5% usually only amounts to a paragraph of text so if you're printing full pages of text or large images the number of pages you'll get will be significantly less than 3,500. What's the difference between a high capacity Konica Minolta 4695MF toner cartridge and a standard one? Do they last longer? Yes, a high capacity toner contains more toner powder than a standard capacity cartridge and acheives a greater duty cycle. The high capacity Magicolor 4695MF toner cartridges deliver a cheaper cost-per-page than the standard capacity cartridges. Therefore, if you print regularly they are more economical to use. The Konica Minolta Magicolor 4695MF is a multifunctional device capable of scanning, printing, copying and faxing at high levels of productivity. From the very start, what jumps out about the Magicolor 4695MF is that print speeds in both colour and monochrome are at 25 pages per minute. That means there isn't any noticeable drop-off going from one print job to another regardless of colour settings. Add in the fact that the unit can handle 600 x 600 dpi resolution and the user can be assured of fast, crisp and clear images on any print job. Connectivity options include Hi-Speed USB, Ethernet 10 Base-T/100 Base-TX/1000 Base-T, and USB host making the Magicolor 4695MF fully network capable. Most Windows, Mac and Linux operating systems are also fully compatible. The 4695MF weighs in at an astonishing 55 kg. It's imposing, but modern frame measures in at 54 cm wide x 59 cm deep x 58 cm tall and comes with a standard media capacity of 350 sheets, upgradeable to 850 sheets. A stylish monochrome LCD display along with push-button selections make navigating the control system easy. The Konica Minolta 4695MF toner reloading system is convenient and simple to use. A 500 MHz CPU and 512 MB of core RAM, expandable up to 1GB, makes the 4695MF perfect for high octane work team performance. Konica Minolta 4695MF toner capacities are very generous and the toner cartridges themselves relatively inexpensive. Standard Konica Minolta 4695MF toner capacity is around 4,000 pages per use with a high-capacity version yielding almost 8000 pages per use. A duty cycle rating over 120,000 pages per month is unusually high when compared to similar systems. 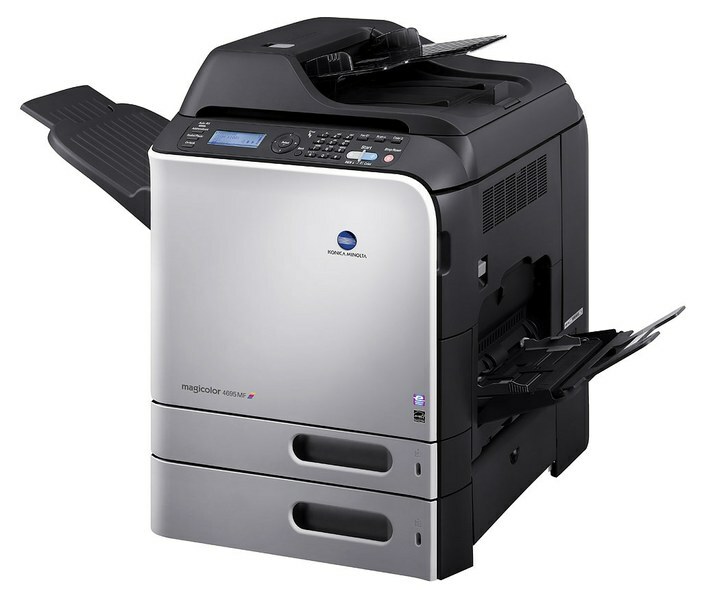 Konica Minolta's 4695MF is a very heavy and awkward machine making it impractical for personal or small office use. It is designed for high-capacity, large office workloads only. Scanning quality could be better, leaving fleshtone colours a little murky.